Follow this link for a list of US and Soviet veterans of the Cuban Missile Crisis attending the conference. More images from the height of the crisis, 24-28 October 1962. Listen to audio clips on the Cuban Missile Crisis from the Kennedy White House. Read the press release from 10 October 2002, including images from the early period of the crisis and a list of US and Soviet veterans attending the conference. Read the press release from 11 October 2002, 1:00 PM, including documents from the period before the crisis and U-2 and US Navy low-level photos of Soviet MRBM's and nuclear warhead bunkers from 14-23 October 1962. Read the press release from 12 October 2002, 1:00 PM, including documents from the November crisis. Cubans thought malaria more dangerous on Oct. 24, but expected invasion by 27th. On the most dangerous day of the crisis, Saturday, 27 October 1962, notes from the Joint Chiefs detail a crescendo of alarming news, ranging from a U-2 spy plane straying into Soviet airspace (1341 hrs. 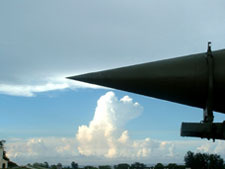 ), a U-2 missing and then determined shot down over Cuba (1403), the Joint Chiefs' recommendation (1600) to the President for the air strike and invasion plan starting no later than Monday, low-level reconnaissance pilots reporting anti-aircraft fire from the ground in Cuba (1800), the President commenting to his top advisers that "time is running out" (1830), and a briefing on the latest photography showing "the missiles are on the launchers" in Cuba (1940). Within five minutes of this briefing, the President's brother was meeting with Soviet ambassador Dobrynin to tell him "time is of the essence and we shouldn't miss the chance," reiterating the President's pledge not to invade Cuba and assuring Dobrynin the US missiles would come out of Turkey in 4-5 months as long as nothing was said publicly about it. In the middle of this sequence of escalating tensions, according to new documents released today, the US Navy was dropping a series of "signaling depth charges" (equivalent to hand grenades) on a Soviet submarine at the quarantine line. Navy deck logs show the depth charges at 1659 and 1729 military time. At the conference table in Havana were the US Navy watch officer, Captain John Peterson, who ordered the depth charges as part of standard operating procedure for signaling submarines, and the Soviet signals intelligence officer, Vadim Orlov, on the receiving end inside submarine B-59, where the depth charges felt like "sledgehammers on a metal barrel." Unbeknownst to the Navy, the submarine carried a nuclear-tipped torpedo with orders that allowed its use if the submarine was "hulled" (hole in the hull from depth charges or surface fire). 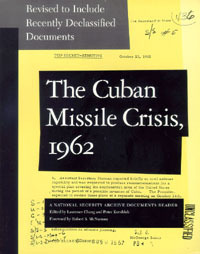 Further evidence of the escalating danger came from a series of military documents declassified by the Cuban government. 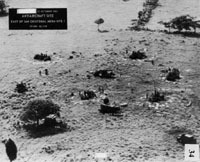 In an October 24th meeting with his commanders, Fidel Castro remarked that they needed to resume fumigation flights because the danger from lack of fumigation (ie. malaria) was at that point even greater than the danger of invasion. By October 27, however, commander in chief Castro had ordered his anti-aircraft gunners to fire on US reconnaissance planes and fully expected an all-out US air strike and invasion within 24 to 72 hours. The conference is meeting at the Palacio de Convenciones in Havana, Cuba. Most participants are housed at the Hotel Palco next door. Phone: 011-53-7-337235. Fax: 011-53-7-337236. The conference room itself is closed to the press but the organizers are holding daily press briefings each afternoon summarizing the discussion and releasing key documents addressed that day. The National Security Archive co-organized with Cuban institutions the highly successful 40th anniversary Bay of Pigs conference last year in Havana; this year, the Archive is also working in partnership with Brown University's Watson Institute. Peter Kornbluh directs the Archive's Cuba project. Click here to join the Archive's Electronic Mailing List and receive E-mail notification when more Cuban Missile Crisis documents are posted and also about other website updates.